Courtesy of Storefront for Art and Architecture. 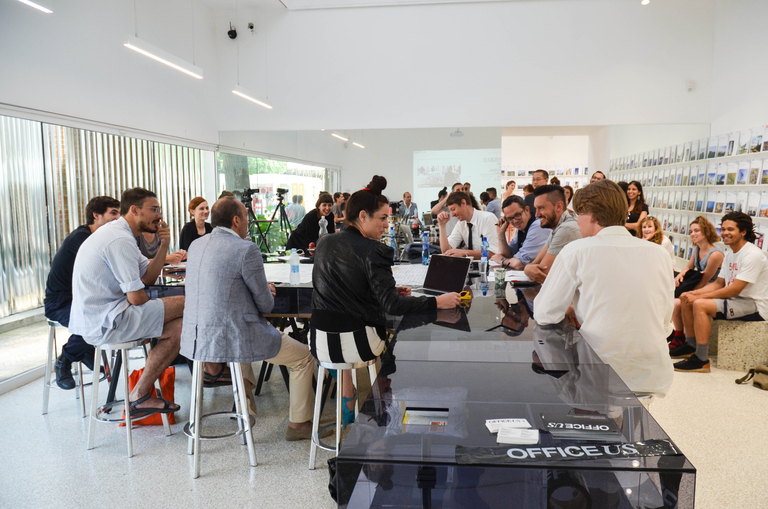 OfficeUS 25 ISSUES TALKS, the inaugural working summit of the United States Pavilion at the 14th International Architecture Exhibition, la Biennale de Venezia, in Venice, Italy. 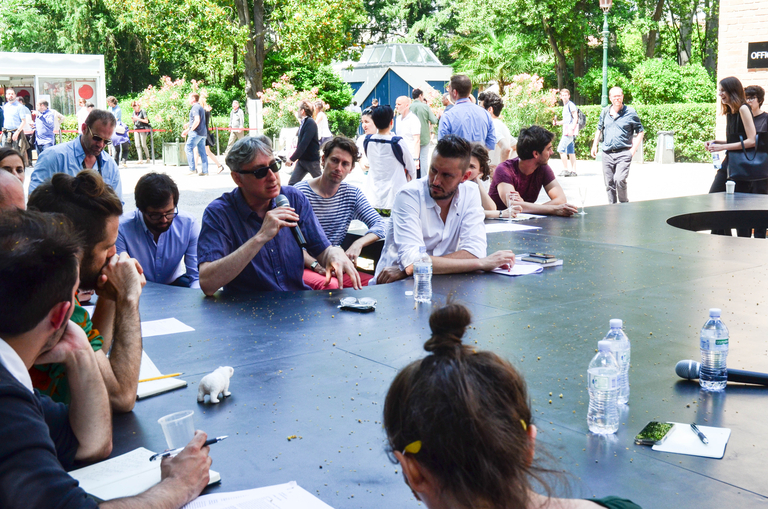 The conversations took place during the opening days, on June 6th, 7th, and 8th at the US Pavilion in the Giardini and launched the six month investigation of OfficeUS. Examining the circulation of ideas through different spaces, individuals and socio-political conditions that have shaped the collective imaginary of 20th century architecture. 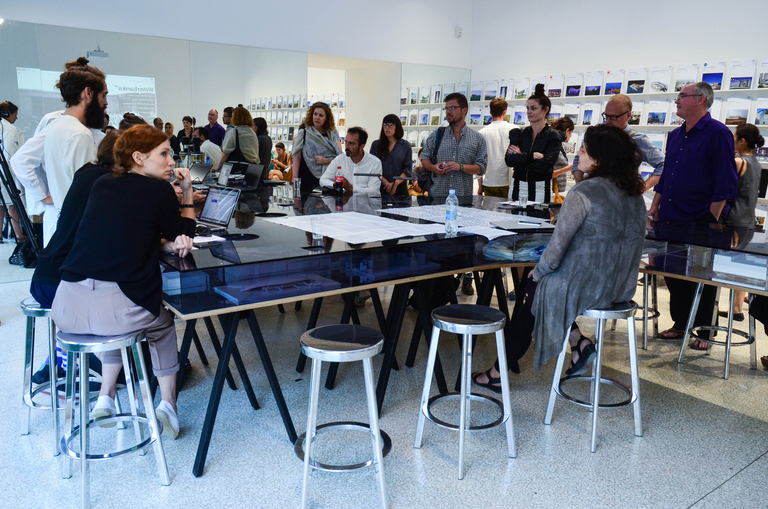 Examining the effects of organizational structures, business models and tools on the life of a practice, as well as on its architectural products while discussing the contemporary totalization of work and play and the spatial, social, economic and creative models associated with it. Examining the energy resource economies as drivers of city form, including contemporary smart cities and off-the-grid settlements. Examining how architecture sneaks in programmatic and ideological agendas into foreign territories in a state of disguise. 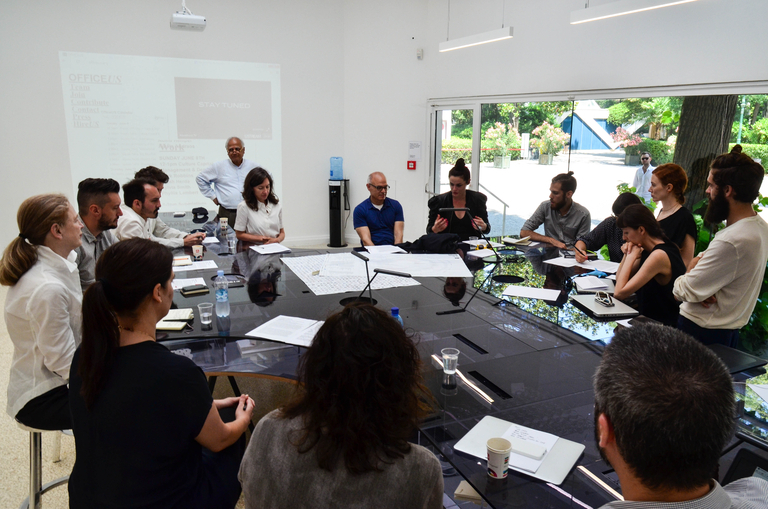 Exploring the protocols that perpetuate the exclusion of social groups from the decision making table while speculating about what new tools, codes and system of measurement can be implemented to produce higher levels of equality among the individuals building, living and servicing architecture. Examining the architectural implications of technological, political and ideological paradigm shifts while exploring the ideological openness – or vacuum- of prototypical architecture, which by definition presents solutions in search of a problem. Exploring historical and contemporary practices of representing national and global citizenship in architecture, images, drawings and film. 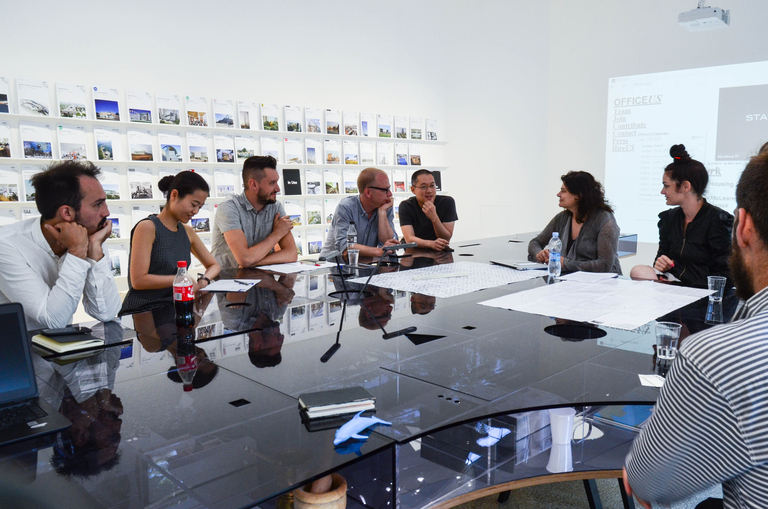 Exploring the contemporary advancements in material and infrastructural research in relationship to structural, technical, political and social performance. Observing the shifting boundaries and redefinition of nations around the world to explore the symbolic and programmatic aspects of contemporary architectural methods and tools for nation building. 6-7 pm Closing drinks and thoughts by Is This Not a Pipe? 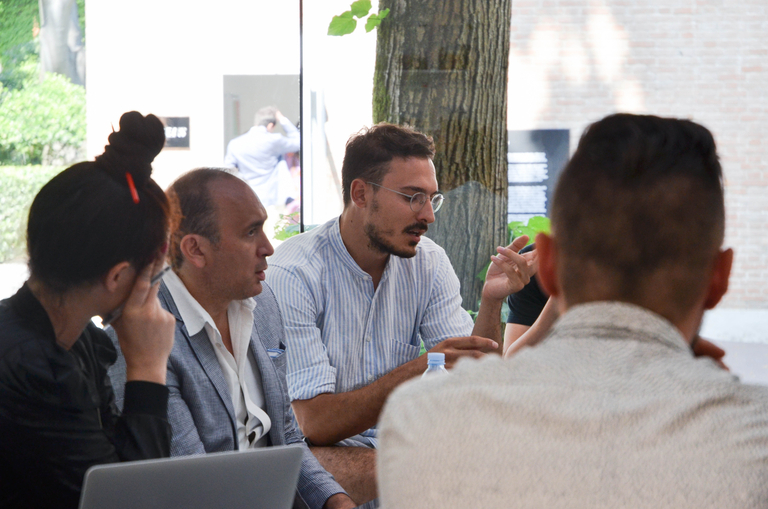 Exploring the consequences of the monetization of the architectures and networks of culture and the currency of culture in the spaces, typologies and protocols of the architectures of diplomacy and contemporary political agendas. Exploring the expertise involved in producing architectures whose specific aim is to operate at the quantifiable limits of a particular technological or operational aim. Examining the historical construction and contemporary forms attached to conceptions of well-being, comfort and leisure around the globe. Exploring the typologies of trade, the logics that instigate them and the physical landscapes that they in turn enable. Exploring the architectural criteria that emerge at the intersection of philanthropy, generosity and cultural colonialism while discussing the history of the US contribution to the writing of building codes and laws that govern the production of cities and buildings internationally, introducing the legal and built protocols that help cultivate a civil society. Exploring the architectural, social and political prototypes that allow access to affordable housing as a global human right while looking into the economic dimension of the global production of architecture, with the focus on the agents whose financial interest has the capacity to transform entire cities and territories. 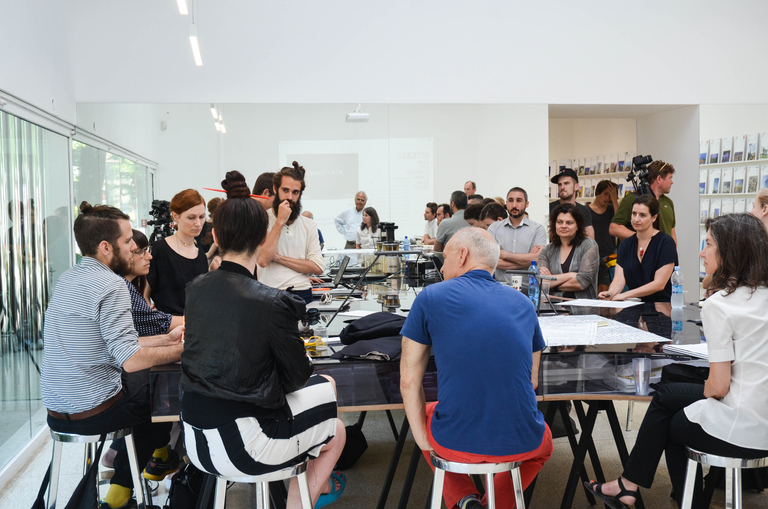 All events were moderated by OfficeUS team members including OfficeUS Curators Eva Franch, Ana Miljacki and Ashley Schafer, Associate and Assistant Curators Michael Kubo and Carlos Minguez and OfficeUS Partners: Arielle Assouline-Lichten, Cooking Sections: Daniel Fernández Pascual & Alon Schwabe, Curtis Roth, Manuel Shvartzberg Carrió, Matteo Ghidoni, and M-A-U-S-E-R: Mona Mahall & Asli Serbest. For a calendar of events, please click here . The OfficeUS schedule is subject to change. 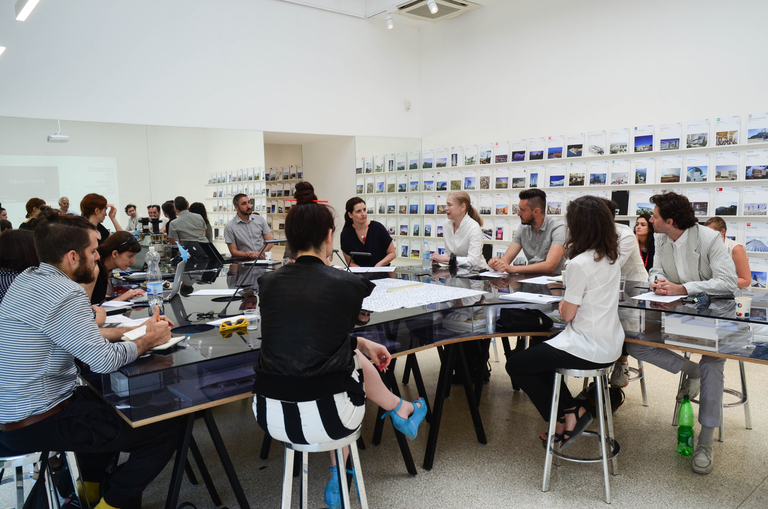 projects are presented in a chronological archive of the last 100 years which visitors access at the OfficeUS Headquarters in the US Pavilion in Venice. Individually and collectively, these issues and projects tell multiple, imbricated stories of US architectural firms, typologies, and technologies, as well as a broader narrative of modernization and its global reach. 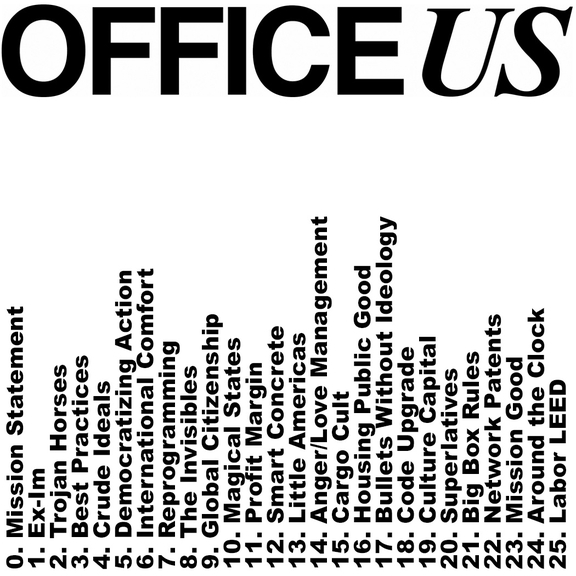 Together, the elements of OfficeUS create an historical record of the contribution of the United States to global architectural thought, and a petri dish in which that record is submitted to contemporary agents of disruption, critique, pessimism, and optimism. 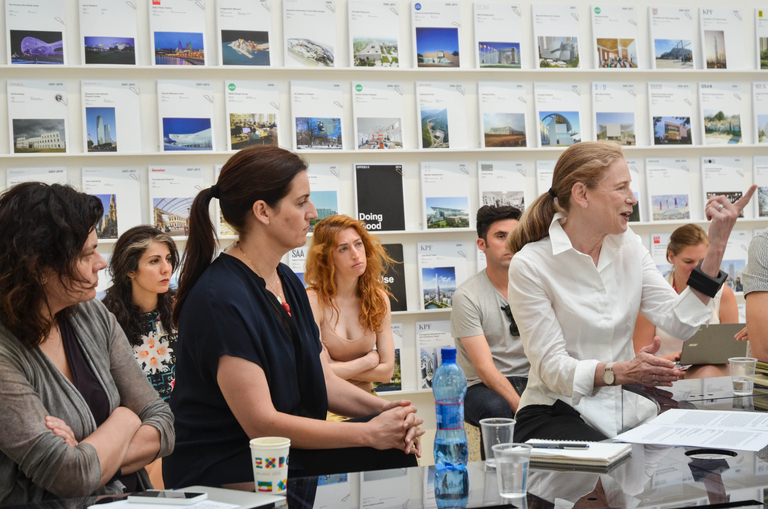 Adina Hempel serves as Assistant Professor of Interior Design in the College of Arts and Creative Enterprises at the Zayed University in Dubai, UAE. 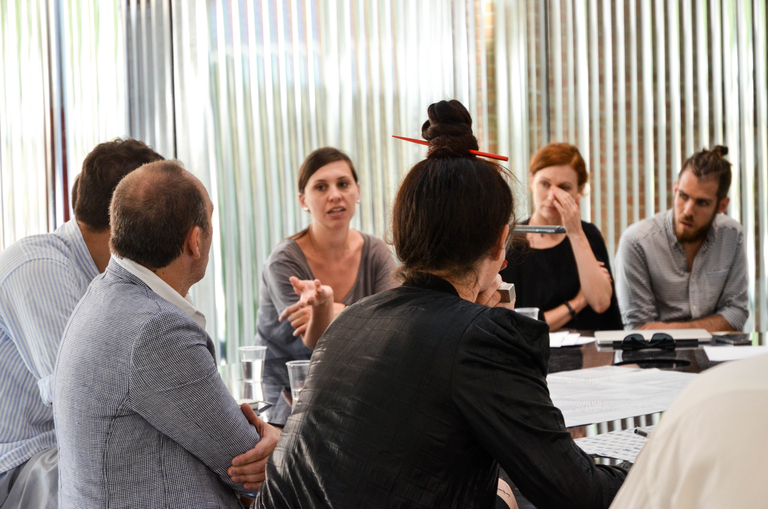 Her work focuses on public space, impact assessment for social design, and sustainable urbanism. Alejandro Zaera-Polo, co-founder with Farshid Moussavi of the London-based Foreign Office Architects (FOA), presents the firm’s recent work and current projects under design and construction including the Meydan Shopping Center in Istanbul, the Ravensbourne College of Design and Communication in Greenwich, UK, and Carabanchel Social Housing in Madrid. Awards to the firm include the Enric Miralles Prize for Architecture; the Kanagawa Prize for Architecture; three RIBA Worldwide Awards; the Special Award in Topography at the 9th Venice Architecture Biennale; the Charles Jencks Award for Architecture; an RIBA European Award for Carabanchel Social Housing in Madrid; and a 2009 RIBA Award for the John Lewis Department Store and Cineplex. FOA also represented Britain at the 8th Venice Architecture Biennale in 2002. The work of the firm has been widely published and exhibited. In parallel to his professional activities, Zaera-Polo has developed a substantial role within academia. He was the Dean of the Berlage Institute in Rotterdam and currently occupies the Berlage Chair at the Technical University of Delft. He is also a Visiting Professor at Princeton University and the first recipient of the Norman R. Foster Visiting Professorship at Yale. He has published extensively as a theorist in El Croquis, Quaderns, A+U, Arch+, Volume, Log and many other international magazines and is a member of the London School of Economics Urban Age project. The practice’s multi-award winning Yokohama International Cruise Terminal in Japan – a dramatically formed port integrated with urban facilities noted for its fascination with the interplay of architecture, landscape and nature and – is credited by the Design Museum as “a design sensation, alive with bustling urbanity and seaside tranquillity”. 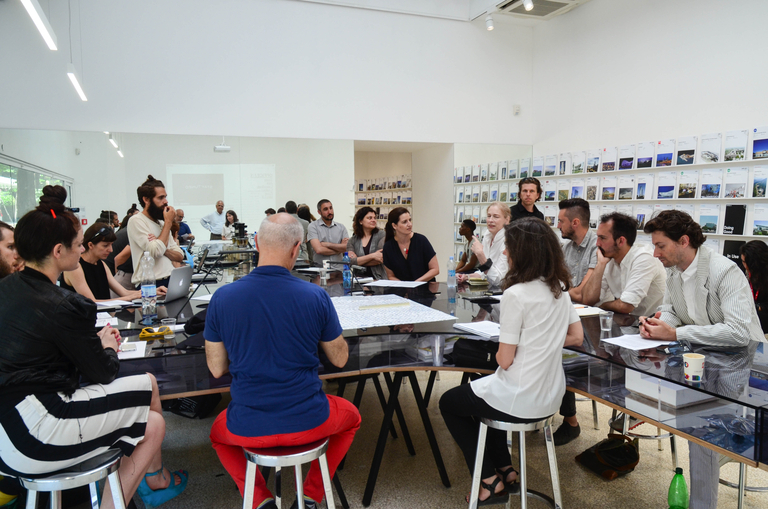 Zaera-Polo graduated from the Escuela Técnica Superior de Arquitectura de Madrid and Harvard GSD with Distinction and worked at OMA in Rotterdam prior to establishing FOA in 1993. Amale Andraos received her B.Arch from McGill University in Montreal and her M.Arch from the Harvard University Graduate School of Design. She is a full-time Assistant Professor at Columbia University’s Graduate School of Architecture, Planning and Preservation and has taught at numerous institutions including Princeton, Harvard and Columbia Universities, the University of Pennsylvania, the Parsons school of design, NY Institute of Technology and the American University in Beirut.Andraos was born in Beirut, Lebanon. She has lived in Saudi Arabia, France, Canada and the Netherlands prior to moving to New York in 2002. She serves on the Architectural League of New York’s Board of Directors. PhD candidate Azadeh Mashayekhi presented a paper at University College London. 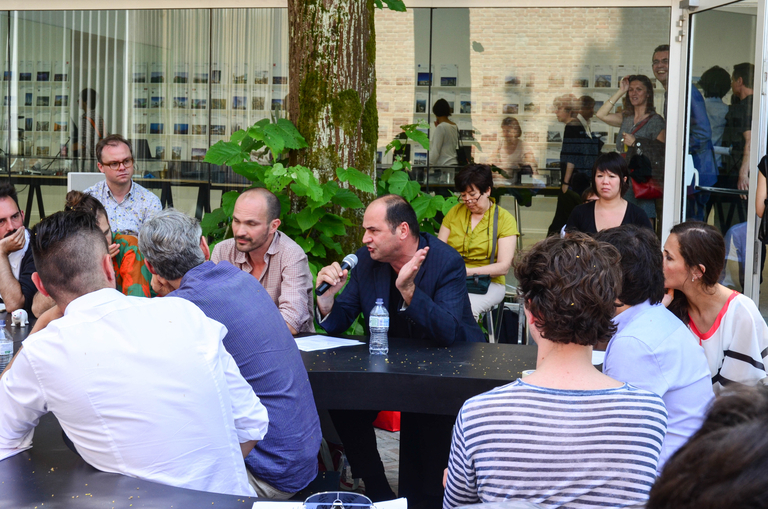 The paper in the ‘Iran urban changes’ conference hosted by the Bartlett Development Planning Unit was a great success. Beatriz Colomina is an internationally renowned architectural historian and theorist who has written extensively on questions of architecture and media. Ms. Colomina has taught in the School since 1988, and is the Founding Director of the Program in Media and Modernity at Princeton University, a graduate program that promotes the interdisciplinary study of forms of culture that came to prominence during the last century and looks at the interplay between culture and technology. In 2006-2007 she curated, with a group of Princeton Ph.D. students, the exhibition “Clip/Stamp/Fold: The Radical Architecture of Little Magazines 196X-197X” at the Storefront for Art and Architecture in New York and the Canadian Centre for Architecture (CCA) in Montreal. The exhibition continues to travel around the world, most recently in the Museum of Design of Barcelona and the Colegio de Arquitectos de Murcia. It will open at the NAI Maastricht in June, and then travel to Santiago de Chile and Montevideo. Over 100 reviews and articles on the exhibition have been published worldwide. An exhibition catalog is forthcoming from ACTAR in September. Bernard Tschumi is an architect based in New York and Paris. First known as a theorist, he exhibited and published The Manhattan Transcripts and wrote Architecture and Disjunction, a series of theoretical essays. Major built works include the Parc de la Villette, the New Acropolis Museum, Le Fresnoy Center for the Contemporary Arts, MuséoParc Alésia and the Paris Zoo. His most recent book is Architecture Concepts: Red is Not a Color, a comprehensive collection of his conceptual and built projects. His drawings and models are in the collections of several major museums, including MoMA in New York and the Centre Pompidou in Paris. 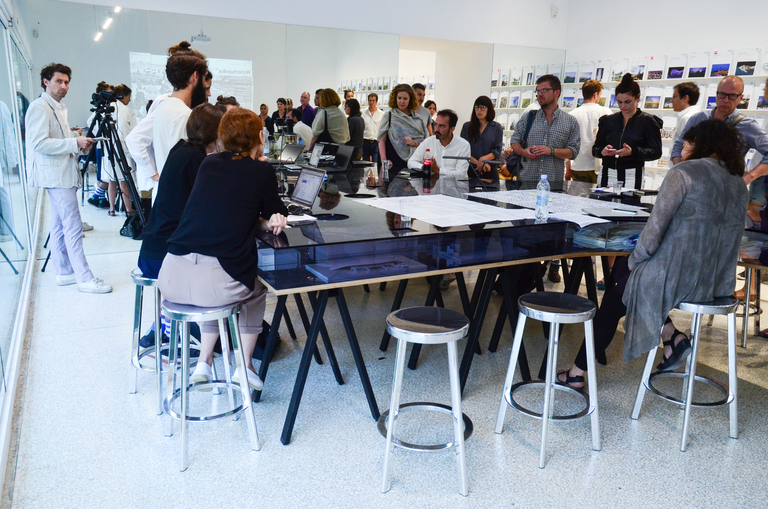 A major retrospective exhibition of Tschumi’s is on view at the Centre Pompidou April 30 – July 28, 2014. Brendan McGetrick is an independent writer, editor, and designer. His work has appeared in publications in over twenty countries, including Wired, Art Review, Domus, and Vogue Nippon. His recent projects include the books MAD Dinner (Actar), Urban China: Work In Progress (Timezone 8), and Who is Architecture? (Domus/Timezone 8). In 2011 he curated Unnamed Design, a component of the 2011 Gwangju Design Biennale, in collaboration with Ai Weiwei. 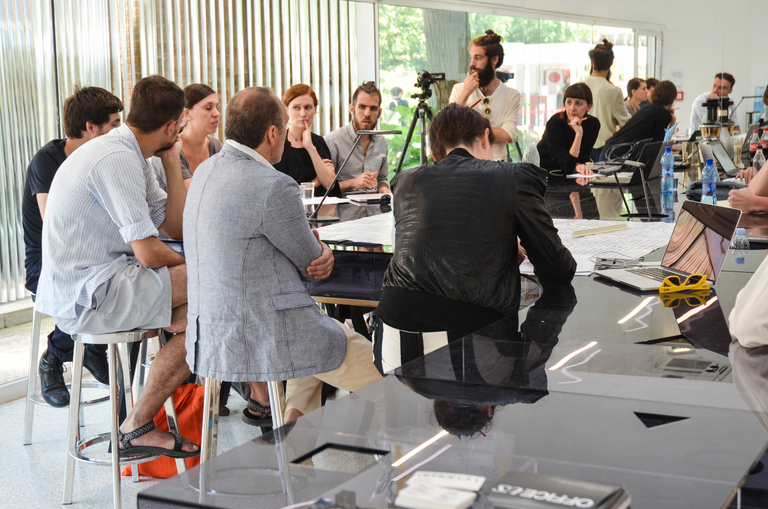 Since 2012 he has served as director at the Strelka Institute in Moscow. From 2002-2006 he served as head writer at the research studio AMO. He is a DJ in his spare time. He believes music is the answer to your problems. 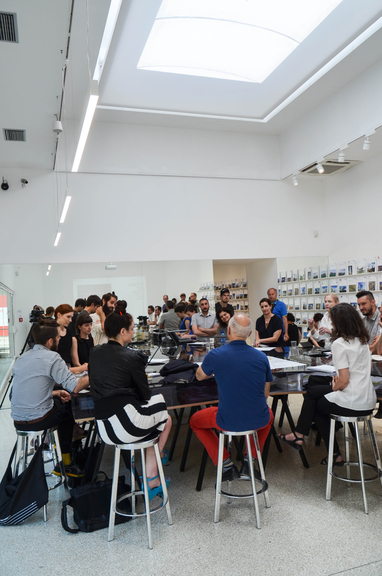 Brendan is the curator of the Russian Pavilion at the 2014 Venice Biennale. 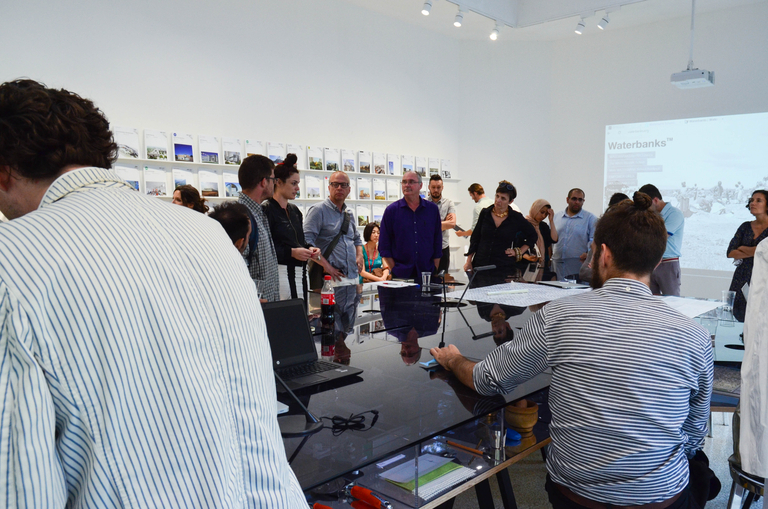 Brett Steele is the Director of the Architectural Association School of Architecture and AA Publications. 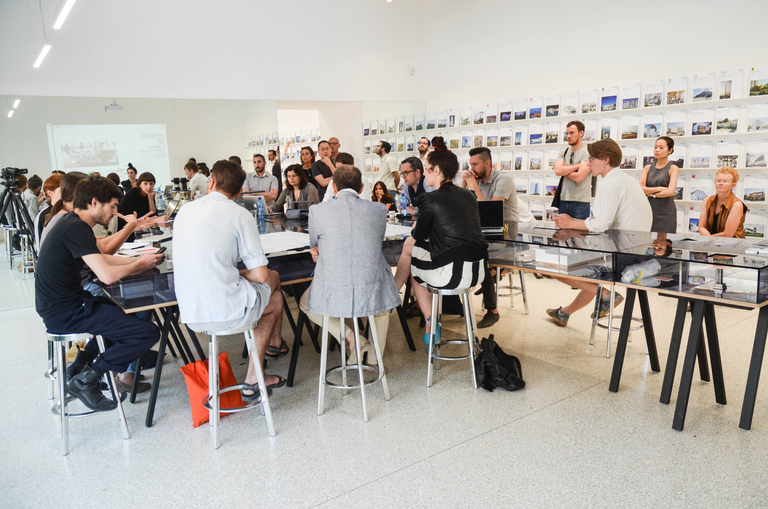 The AA is the UK’s oldest and only private school of architecture, and has for decades been recognized as an influential world-wide leader in architectural education. AA School graduates are the recipients of numerous prizes including Pritzker Prizes, RIBA Gold Medal & Stirling Awards, AIA and other design awards. 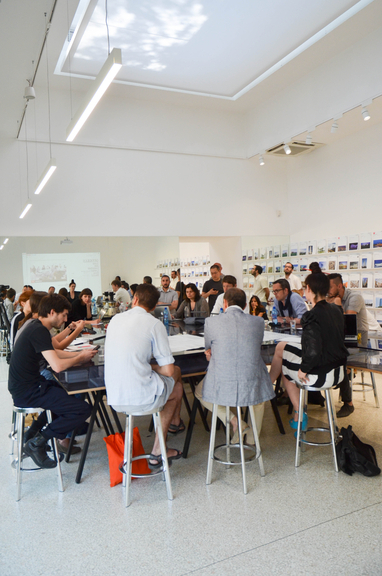 The AA School is the world’s most international school of architecture, with full-time students joining the AA from more than fifty home countries each year. Brett also directs the AA Public Programmes, which each year organizes one of the world’s largest public programmes dedicated to contemporary architectural culture, presented at the AA and other venues and including dozens of visiting architects, artists, exhibitions, symposia and other events open to a public audience as well as 3,000 AA members world-wide. Charles Waldheim is John E. Irving Professor of Landscape Architecture and Chair of the Department of Landscape Architecture at Harvard’s Graduate School of Design. 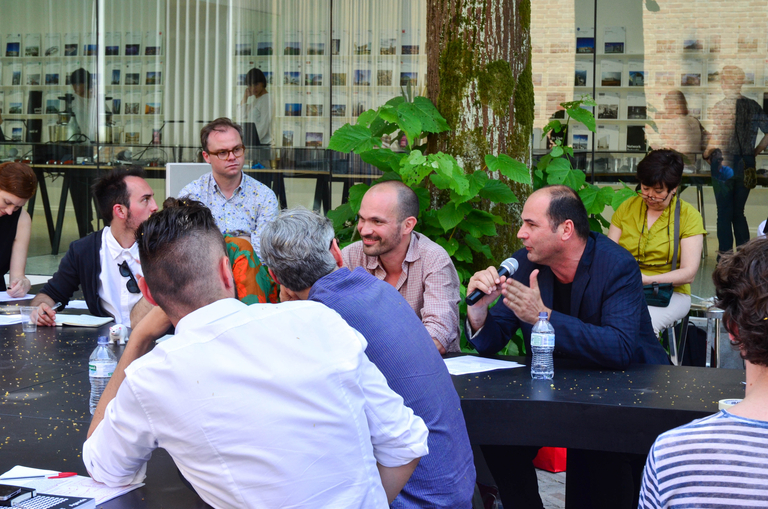 Previously, Waldheim was Associate Professor and Director of the Landscape Architecture program at the University of Toronto. 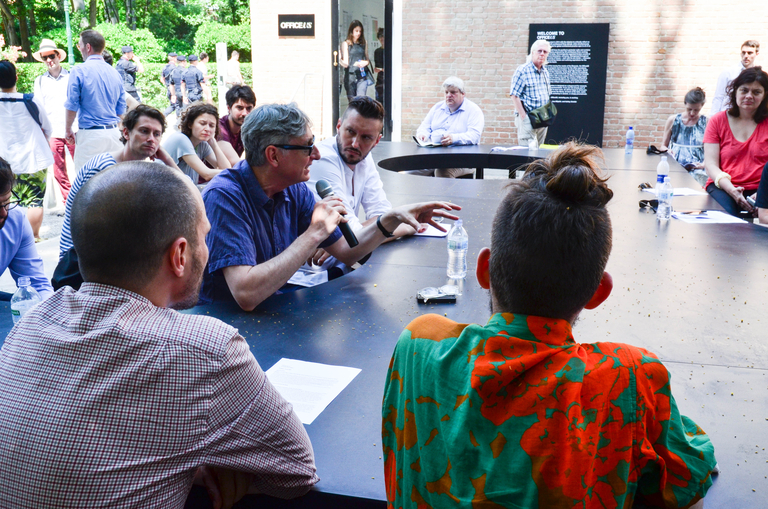 He has lectured on landscape and contemporary urbanism across North America, Europe, and Australasia. He has taught as a visiting faculty member at Harvard University, the University of Michigan, the University of Pennsylvania, and Rice University. He is an honorary member of the Ontario Association of Landscape Architects, and in 2006 was recipient of the Rome Prize Fellowship in Landscape Architecture at the American Academy in Rome. Craig Buckley received an MA from the University of Western Ontario in 2002, and then participated in the Whitney Independent Study Program in 2003. His research focuses upon relationships between architectural practice, new genres of publication, and politics in the postwar period. Recent books include Dan Graham¹s New Jersey (coedited with Mark Wasiuta, Lars Müller Publishers, 2012), Utopie: Texts and Projects 1967-1978 (with Jean-Louis Violeau, Semiotext(e) 2011) and Clip/Stamp/Fold: The Radical Architecture of Little Magazines 196X-197X (with Beatriz Colomina, ACTAR Press 2010). His writing and criticism have appeared in the journals Anarchitekur, Log, October, and Perspecta, among others. 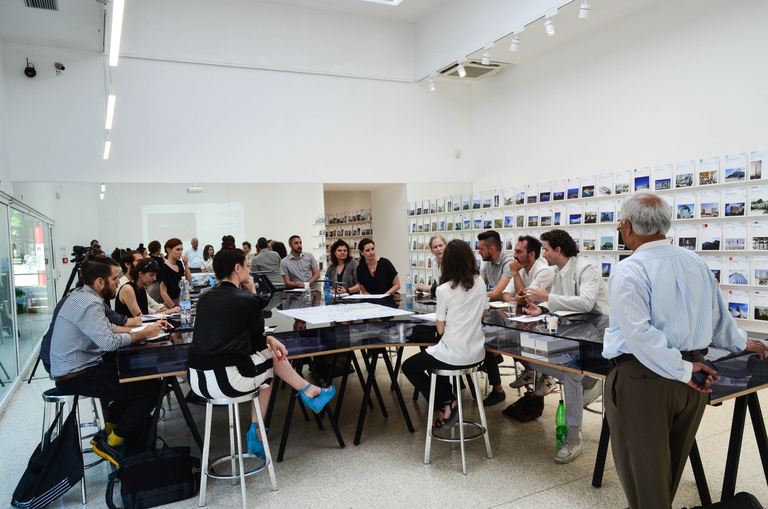 He is an adjunct assistant professor at Columbia University¹s Graduate School of Architecture, Planning, and Preservation, where he is also the Director of Publications. Mr. Buckley was appointed critic in graphic design at Yale in 2010. Daniel Perlin is an experiential designer. He currently directs experiential design at Droga5, as well as maintains Perlin Studios, both in New York. His work has appeared at MoMA, The Guggenheim, PS1, and The Center for Hearing and Communication, The New Museum and other institutions. Daniel likes to collaborate, and has done so in the past with Vito Acconci, Maya Lin and the Storefront for Art and Architecture, Domus Magazine, Todd Solondz and Raul Morão. Daniel teaches a course on Sound and the City at NYU’s ITP department, and in fall 2014 he will be a Fellow at Parson’s CTM media and design program. David Benjamin is an architect and professor whose work unites synthetic biology with architecture in the creation of dynamic, living structures. His work also focuses on repurposing already-existing materials and structures in ways that subvert their original purpose and redirect them toward sustainability. 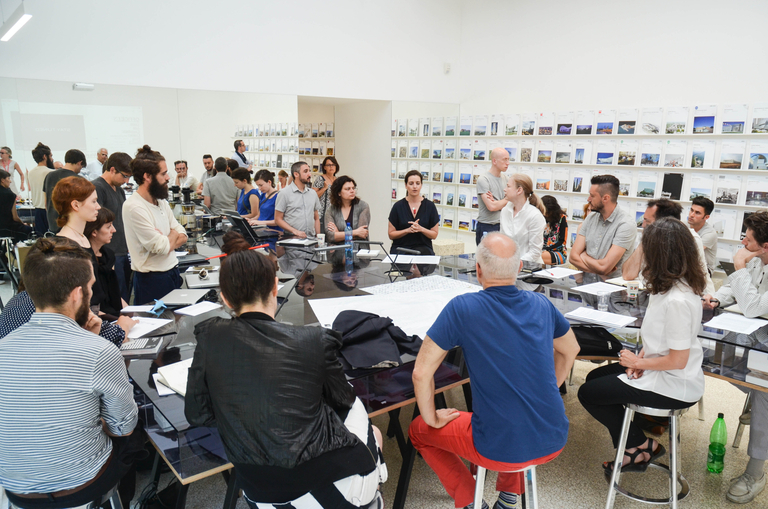 David teaches at the Columbia Graduate School of Architecture, Planning and Preservation, where he formed the Living Architecture Lab, which experiments with new systems and adaptive technologies through open source, collaborative, hands-on design. He is co-founder of The Living, a firm dedicated to creating architecture that is both interactive and responsive to environmental conditions. His innovations include Living Light, a permanent, illuminated pavilion in Seoul that visually reports changes in air quality, and Amphibious Architecture, a floating installation in New York’s East River that enabled participants to communicate with fish and learn about water pollution. Along with his partner Soo-In Yang, he has recently released the book series Life Size, which explores the possibilities of creating open source design processes. He holds a B.A. in Social Studies from Harvard and a Master of Architecture degree from Columbia. David Glover serves as Chief Executive of Building Engineering at AECOM Technology Corporation. David Turnbull s a Director of ATOPIA Innovation llc, and Design Director of ATOPIA Research Inc dba PITCHAfrica, an award winning 501(c)3 tax exempt organization registered in New Jersey, USA, with a specific focus on the development and construction of building types that address global ecological and social challenges. I have worked extensively in the UK, Japan, SEAsia, China, the Middle East, Egypt, East Africa, West Africa, Europe and the USA. PITCHAfrica’s first WATERBANK School was named ‘The Greenest School on Earth’ by the USGBC. WATERBANK Schools were selected by SUSTAINIA in Denmark as one of the top 100 sustainable solutions in the World and won the INTERFACE support award in the 2013 Buckminster Fuller Challenge. Eliot Noyes is a Professor of Architecture Theory. 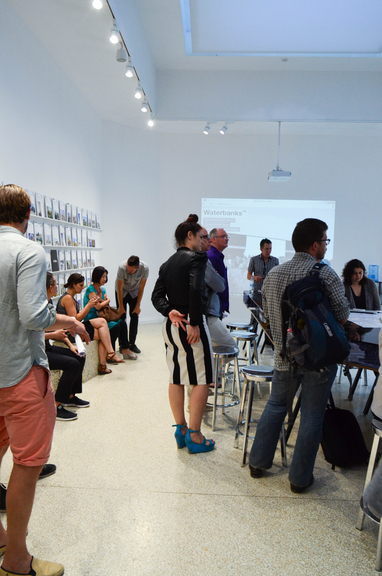 Publications include Architectural Theory since 1968 and Architecture’s Desire. Eric Cesal is a designer, builder, analyst and writer. A native of Washington, D.C., Eric completed his undergraduate studies at Brown University in Providence, Rhode Island, and achieved a Masters in Architecture, a Masters in Construction Management and a Masters in Business Administration from Washington University in St. Louis. Eric first joined Architecture for Humanity in 2006 as a volunteer in Biloxi, Mississippi. He followed up that work with another stint in the Lower 9th Ward in New Orleans, Louisiana, before joining Architecture for Humanity full time in 2010. Erica Stoller is the director of Esto, the photo agency that represents a group of architectural photographers and handles an archive of related images: architecture, interiors, landscape and more. The collection is based on the work of Ezra Stoller, her father, who began his career in the late 1930s and is known for his images of mid-Century Modernism. He died in 2004. Erica is a member of the Picture Archive Council of America, the American Society of Picture Professionals and is an associate member of the American Society of Media Photographers.Beyond this realm, she is an artist, making wall sculpture from industrial materials, and is represented by A.I.R. Gallery in Brooklyn. Erin Rae Hoffer fosters innovation in design and practice as Senior Industry Programs Manager with Autodesk, a leading provider of software for building information modeling. An architect and technologist with twenty-five years of experience, Erin is a board member of the National Institute of Building Standards Council on Finance, Insurance and Real Estate (CFIRE), co-chair of the Boston Society of Architect’s Building Systems Committee, and a member of the AIA’s National Committee on Codes and Standards. Erin is a registered architect, a member of the AIA, BOMA and the Urban Land Institute. She is a LEED-Accredited Professional. Ethel Baraona Pohl is a critic, blogger and curator [but she prefers Professional Amateur]. She is a co-founder of dpr-barcelona and editor of Quaderns. 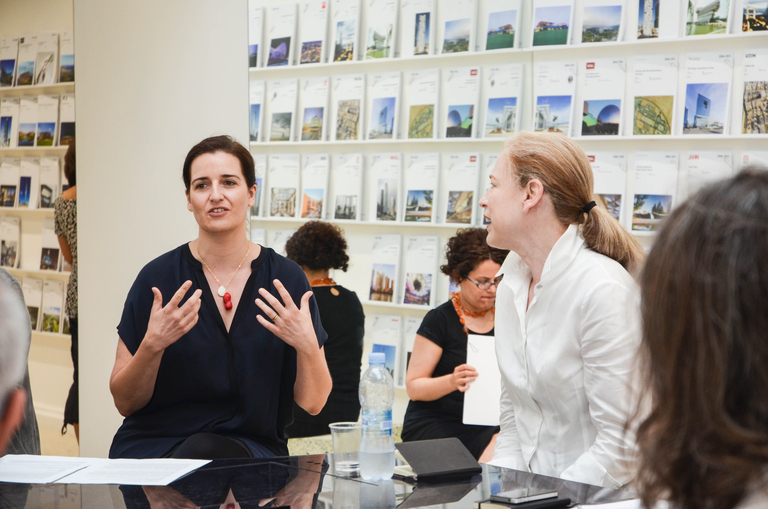 She was associate Curator for “Adhocracy” exhibition, first commissioned for the Istanbul Design Biennial in 2012, also exhibited at The New Museum, NYC and at Lime Wharf LONDON in 2013. 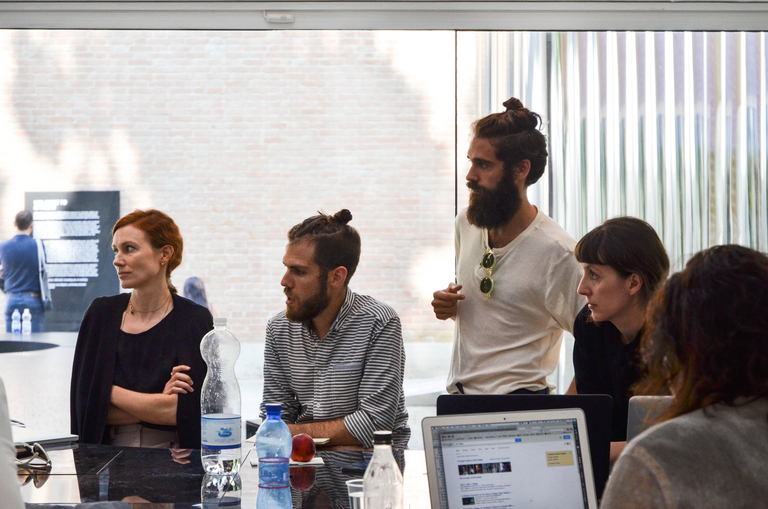 Currently she curates, with César Reyes Nájera, the third Think Space programme with the theme ‘Money’. Felicity D. Scott is associate professor of architecture and director of the program in Critical, Curatorial and Conceptual Practices in Architecture (CCCP) at the Graduate School of Architecture, Planning and Preservation, Columbia University. She is also a founding co-editor of Grey Room, a quarterly journal of architecture, art, media, and politics published quarterly by MIT Press since Fall 2000. Her work as an architectural historian and theorist focuses on articulating genealogies of political and theoretical engagement with questions of technological transformation within modern and contemporary architecture, as well as within the discourses and institutions that have shaped and defined the discipline. In addition to publishing numerous articles in journals, magazines, and edited anthologies, her book, Architecture or Techno-Utopia: Politics After Modernism, was published by MIT Press in 2007, and another book, Living Archive 7: Ant Farm, appeared on ACTAR Editorial in May 2008. She has recently completed the manuscript for a book entitled on the Austrian émigré architect Bernard Rudofsky, entitled “Cartographies of Drift: Bernard Rudofsky’s Encounters with Modernity,” and has undertaken substantial research and writing on her subsequent book-project, “Outlaw Territory,” which investigates architecture’s relation to “human unsettlement” and territorial insecurity. She has also written on contemporary art and architecture for magazines including Artforum and Texte zur Kunst as well as in exhibition catalogs. She received her PhD from Princeton University in 2001, and an MAUD from Harvard University in 1994, and is the recipient of many awards, including Graham Foundation for Advanced Studies in the Fine Arts Grant (2011), a New York State Council on the Arts Independent Project Award (2010), a Clark Fellowship (2008), an Arts Writers Grant from Creative Capital/Warhol Foundation (2007), a J. Paul Getty Postdoctoral Fellowship (2002-2003), and a Henry Luce/ACLS Doctoral Dissertation Fellowship in American Art (1998-1999). Eyal Weizman is an architect, Professor of Visual Cultures and director of the Centre for Research Architecture at Goldsmiths, University of London. Since 2011 he also directs the European Research Council funded project, Forensic Architecture – on the place of architecture in international humanitarian law. Since 2007 he is a founding member of the architectural collective DAAR in Beit Sahour/Palestine . Weizman has been a professor of architecture at the Academy of Fine Arts in Vienna and has also taught at the Bartlett (UCL) in London at the Stadel School in Frankfurt and is a Professeur invité at the École des hautes études en sciences sociales (EHESS) in Paris. He lectured, curated and organised conferences in many institutions worldwide. His books include Mengele’s Skull (with Thomas Keenan at Sterenberg Press 2012), Forensic Architecture (dOCUMENTA13 notebook, 2012), The Least of all Possible Evils (Nottetempo 2009, Verso 2011), Hollow Land (Verso, 2007), A Civilian Occupation (Verso, 2003), the series Territories 1,2 and 3, Yellow Rhythms and many articles in journals, magazines and edited books. Weizman is a regular contributor and an editorial board member for several journals and magazines including Humanity, Inflexions and Cabinet where he has edited a special issue on forensics (issue 43, 2011). He has worked with a variety of NGOs world wide and was member of B’Tselem board of directors. He is currently on the advisory boards of the Institue of Contemporary Arts (ICA) in London, the Human Rights Project at Bard in NY, and of other academic and cultural institutions. Weizman is the recipient of the James Stirling Memorial Lecture Prize for 2006-2007, a co-recipient of the 2010 Prince Claus Prize for Architecture (for DAAR) and was invited to deliver the Rusty Bernstein, Paul Hirst, Nelson Mandela, Mansour Armaly and the Edward Said Memorial Lectures amongst others. He studied architecture at the Architectural Association in London and completed his PhD at the London Consortium/Birkbeck College. Francisco Gonzalez-Pulido, president at the esteemed architectural firm, has been recognized for his visionary design approach and drive for innovation. He shares the design leadership of the firm’s work with Helmut Jahn. 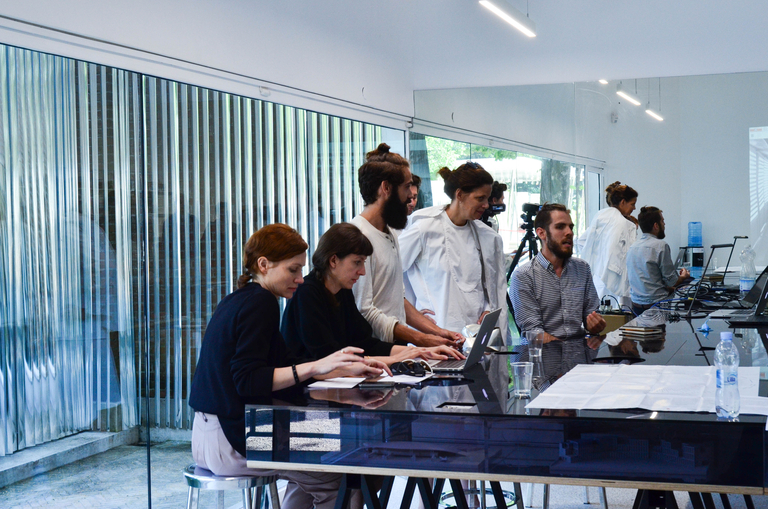 Gonzalez-Pulido was named one of the 10 Most Promising Mexican Architects by OBRAS magazine. He’s worked on some of the most recognizable projects to date, including the State Street Village; Chicago; Hegau Tower, Hafen Düsseldorf, Germany; Veer Towers, Las Vegas; Leatop Plaza, China; Doha Convention Center +Tower, Qatar; Japan Post Tower, Tokyo; O’Hare Airport Expansion, Chicago and Tokyo Station. 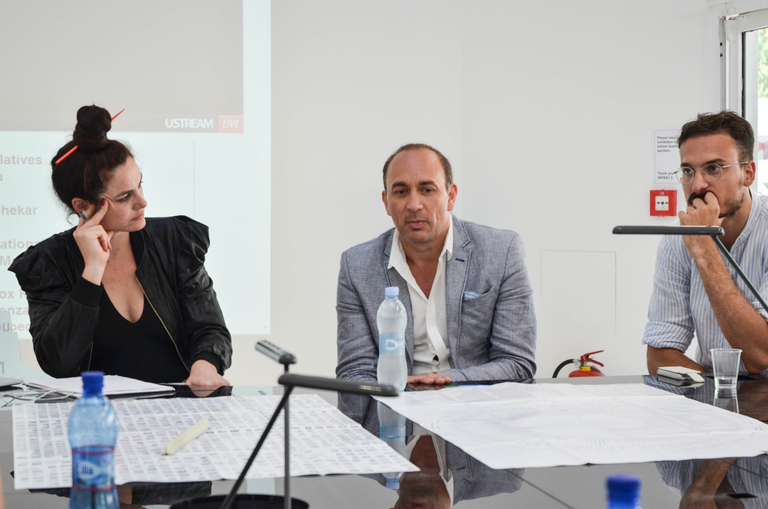 Florian Idenburg is founding partner of SO – IL, an internationally acclaimed architecture studio based in New York. Founders Florian Idenburg and Jing Liu envisioned their studio in 2008 as a creative catalyst involved in all scales and stages of the architectural process. 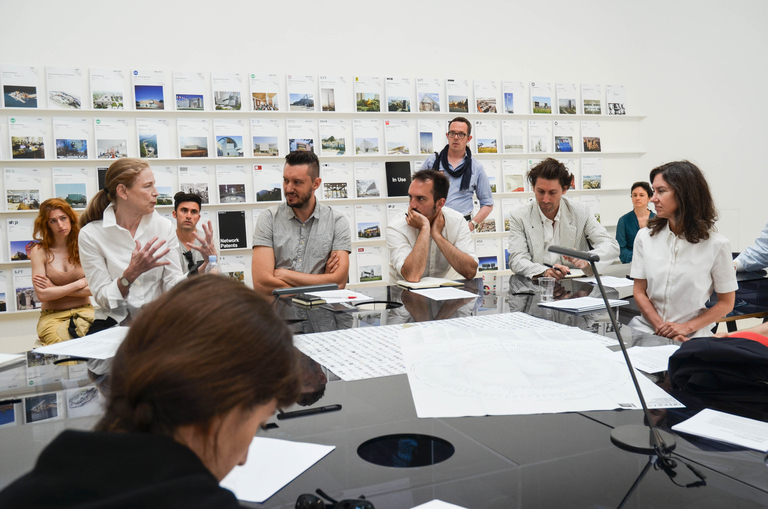 With roots in Europe, China and Japan—and sharing the optimism for architectural feasibility typical in those countries—Idenburg and Liu operate in the zone between academia and practice. 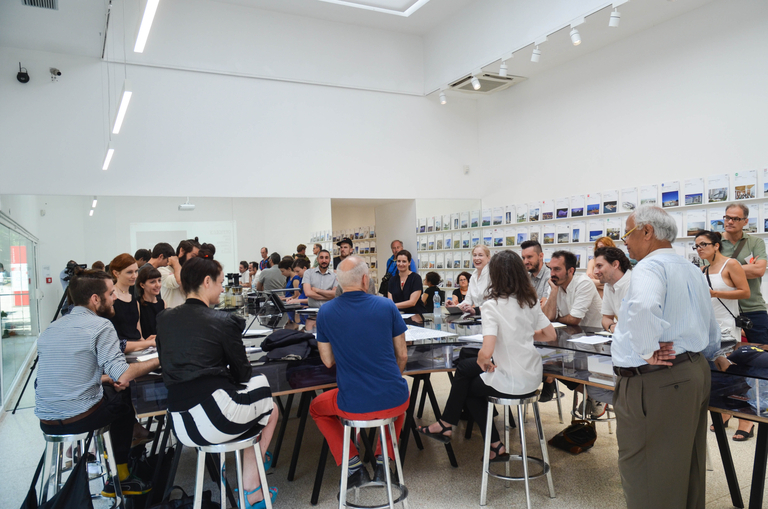 Since its inception, SO – IL has worked on an array of projects ranging in scale from a series of prints for the Guggenheim Museum to the master plan of a cultural campus in Seoul. Recent projects include a wedding chapel in Nanjing, China, student housing in Athens, Greece, and a park pavilion in Amsterdam, the Netherlands. 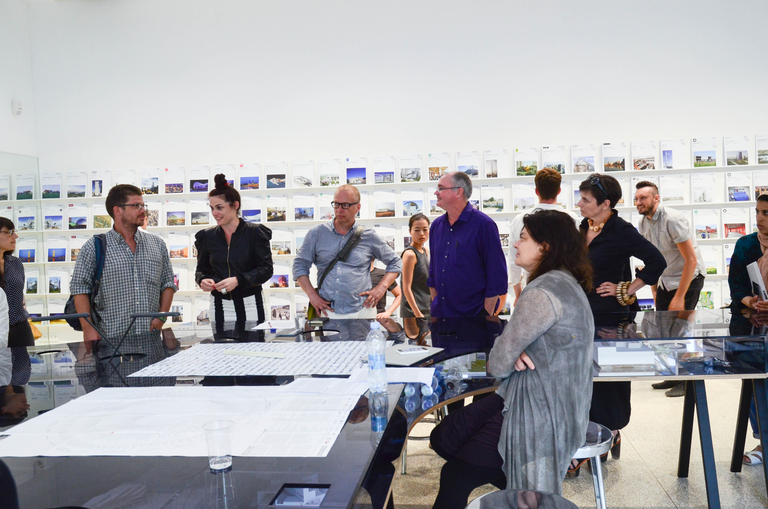 What unifies these projects is an intellectual and artistic rigor that has become SO – IL’s hallmark. Recognition for this approach is manifested through numerous prizes such as the MoMA PS1 Young Architects Program as well as the AIA NY Young Practices Award, both in 2010. SO – IL has been widely featured in international publications including the New York Times, Wall Street Journal, Wallpaper* and Surface Magazine. 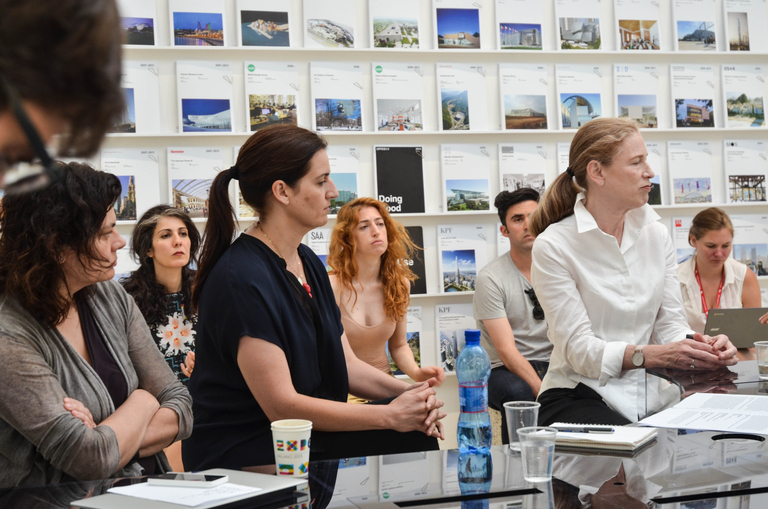 Their work has been exhibited at the Guggenheim Museum, MoMA, the LA Forum for Architecture and Urbanism, the Benaki Museum in Athens, the Center for Architecture in New York and Studio-X Beijing in China.